Updated with details of Microsoft's European cloud expansion announcement Monday. While EdgeConneX's primary business has been operating smaller data centers in edge data center markets to help content and cloud companies optimize delivery of their services to end users, a recent Microsoft data center deal signals that the company is looking beyond its core edge-focused model as well. The Comcast Ventures-backed data center provider appears to be throwing its hat into the ring to compete for large wholesale cloud deals with the likes of Digital Realty Trust and DuPont Fabros Technology. Access to capital and existing C-suite relationships give the company leverage in this market, which is currently seeing unprecedented growth fueled by the expansion of cloud data center capacity by tech giants, including Microsoft, Amazon, and Google, among others. EdgeConneX recently bought a large industrial building in Elk Grove Village, just outside of Chicago, and secured the necessary power to convert it into a data center. Crain's Chicago Business reported details of the real estate transaction, citing public records: The 132,000-square foot building was built in 2005 and purchased from industrial REIT Prologis, Inc. for $22.8 million, or just under $175 per square foot. But there appears to be far more to this story. According to a source familiar with the Elk Grove acquisition, the facility at 1800 Nicholas Road is slated to become a 25-30MW build-to-suit data center leased to Microsoft Corporation. EdgeConneX has told Data Center Knowledge that it will only enter a new market if it has an anchor tenant for it. This business model insures each new data center will generate cash flow on day one. "We don’t speculatively build massive data centers and then hope to build an ecosystem in that site over time. We instead work closely with our customers - some of the world’s largest network, content and cloud service providers - and build tailored facilities to their needs, exactly where they need them." As of this writing, EdgeConneX has not responded to a request for comment. Chicago is not the company's first foray into the large-scale data center market. It began by constructing a large-scale project in European data hub Amsterdam, adjacent to the large Interxion campus near Schiphol airport. There are also mega-scale EdgeConneX projects underway in the Dublin and London markets. It has previously said that it intends to roll out smaller "edge" data centers in markets across Europe, initially to support the efforts of cable and media giant Liberty Global, which is also an EdgeConneX investor. 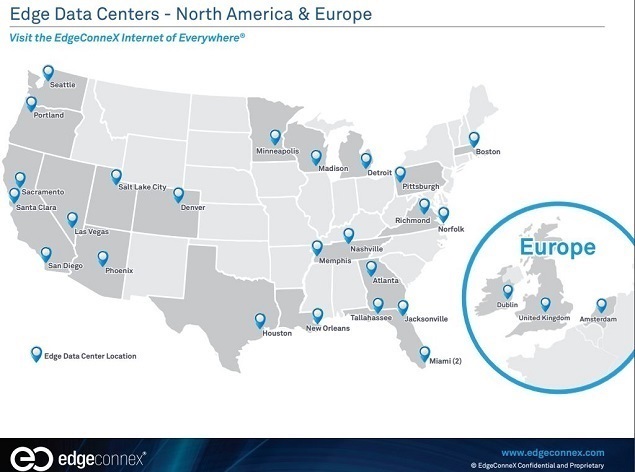 The same source that told us about the Elk Grove transaction said Microsoft is also the anchor at EdgeConneX data centers in Amsterdam and Dublin. In fact, all three mega-scale deals may have been negotiated at the same time. Heiden had stated previously that EdgeConneX is bringing one of the top two mega-scale cloud providers into its Amsterdam facility, and its Dublin project is near an existing Microsoft data center at Grange Castle Business Park. In addition to Microsoft, cloud giants Amazon, Apple, Google, and Facebook are all active in the Dublin market, but Microsoft is the world's second-largest cloud provider, after Amazon. On Monday, Microsoft CEO Satya Nadella and president Brad Smith spoke at an event in Dublin about the company's recent and upcoming cloud data center investments in Europe. The company has spent about $3 billion on European operations to date. Its cloud customers there include the UK Ministry of Defense, the Renault-Nissan Alliance, Ireland’s Health Service Executive, and German auto-parts maker ZF. The announcement included a mention of Microsoft's cloud data center investments in Ireland and the Netherlands and revealed plans to open a data center in France. The news release followed last week's announcement by the company's biggest competitor in the cloud market, Amazon Web Services, of an upcoming data center launch in the Paris metro. Beginning with one leased facility outside of Houston, EdgeConneX has quickly built about two dozen data center facilities across secondary markets over the past two years. These data centers are typically 2MW, designed with capacity to expand by another 2MW or more, depending upon the market. These facilities are usually anchored by cable companies and content providers, including Comcast, and other investors in EdgeConneX, such as Cox and Akamai. There are also many customers who are not investors, including networks and IT service providers. These facilities are also designed as speedy and secure access points to public cloud providers for enterprise customers. EdgeConneX leases colocation space to wholesale users who offer products and services to enterprise customers. Read More: Can EdgeConneX Disrupt Incumbent Data Center Providers? Unlike many private data center operators, EdgeConneX has enough financial horsepower to expand at a rapid pace and own the vast majority of its facilities. In fact, the company recently purchased its original Katy, Texas, data center (outside of Houston) from former landlord StratITsphere. As I wrote in an earlier piece, "EdgeConneX is a fast-growing, disruptive data center player that investors in publicly traded data center REITs should be aware of and watch very closely." There can no longer be any doubt that it is a disruptive competitor. The immediate question now becomes: Will the Chicago project be a one-off, or is it the beginning of a strategic wholesale initiative in top US markets? Yevgeniy Sverdlik contributed to this story.